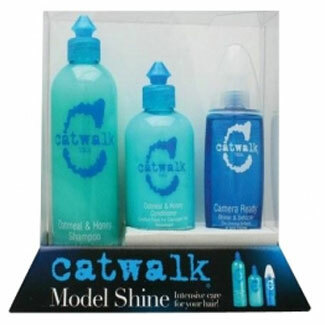 Intensive care for your hair the TIGI Catwalk Model Shine grants the frizz free wish. With an Oatmeal & Honey Shampoo and Conditioner, and a Camera Ready sidekick this pack is actually worth over �30! TIGI Catwalk Oatmeal & Honey Shampoo.- 350ml Helps improve chemically treated or damaged hair with vitamins A, B & E. The soothing aroma invigorates your mind, body and soul. TIGI Catwalk Oatmeal & Honey Conditioner � 250ml Helps improve the condition of your hair with soy and wheat protein while enhancing moisture and shine. TIGI Catwalk Camera Ready � 100ml Satisfies the craving for brilliantly silky, shiny, frizz-free hair with a mouth-watering watermelon scent.